St Peter Line’s Princess Anastasia is a contemporary and world class cruise vessel with an extensive 2500 passenger capacity. On board travellers will be able to select from 834 luxurious cabins as well as taking advantage of the spacious 580 berth car deck. A large range of bars and restaurants are thee for all travellers to enjoy as well as a spa, casino, cinema and a well-stocked duty free section. 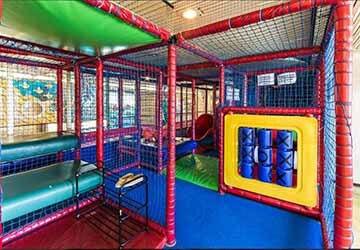 The kids are taken care of with the playroom that comes with a qualified nanny service. On board there is also a foreign exchange centre and a medical area. Seven different classifications of cabin spread across four decks are available to those making their trip across the Baltic Sea. 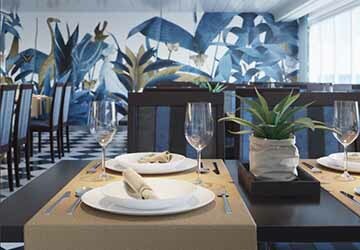 All rooms are equipped with comfortable bedding, clothes storage facilities and air conditioning. Rooms also have individual shower areas with toiletries and fresh towels. The top of the range cabins include the Suite. This luxurious apartment comes with a spectacular sea view and inside has a comfortable sofa, armchairs and a TV. The Suite service includes a deluxe breakfast in the a la carte restaurant, a sauna visit, Wi-Fi access and free minibar. The Deluxe and Commodore cabins also include these perks. For a fantastic combination of price and quality choose from the Class A, Class B and Class B2V options. With soft bedding and separate bathroom facilities you’ll be able to relax and get a good night’s sleep. 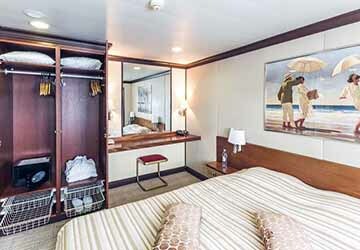 These rooms can cater for one to four passengers. For those travelling with restricted mobility or need special assistance there’s the Class HA room. This cabin is equipped with railings, special grab bars and also has a floor covering consisting of antiallergic coating. 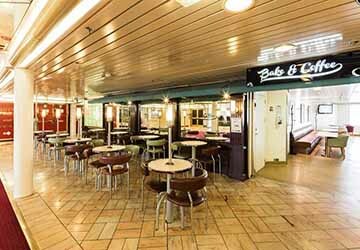 There is a huge range of eateries on the Princess Anastasia, with cosy cafes, pubs, restaurants and brilliant bars. 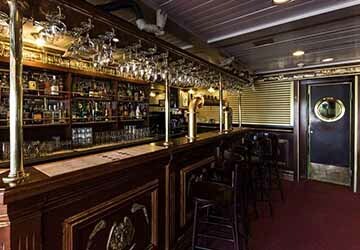 In total there are 10 top class bars and restaurants spread across the 11 deck vessel. For a snack head to Bake and Coffee. Here you’ll find sandwiches, soups and salads, as well as hot and cold beverages and even some sweet treats. For something a little more substantial there are options aplenty. 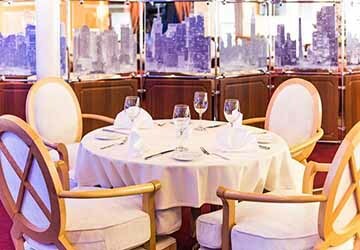 The Princess’ Garden provides a buffet, New York City sees a mix of cuisines from around the world and then there’s the Italian restaurant Napoli Mia. Don’t want to miss the live sport? Fancy a bit of Karaoke? 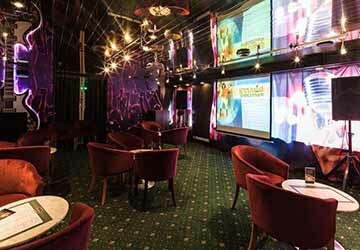 The new Legend sports bar is kitted out with comfy armchairs, giant screens, a wide selection of alcoholic beverages and of course a karaoke machine to keep everyone entertained. 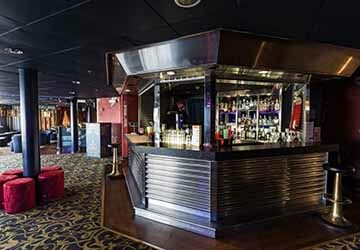 For more drink and entertainment options you have ship top views in Sky Bar, the quirky interior of Smoking Bar, the club atmosphere of Night Funny Rabbit, the English style pub Funny Rabbit and the Broadway shows in Columbus Bar. A massive range of duty free choices await you on this St Peter Line service. World famous brands come at incredibly low prices with a great mix of Russian, European and international goods. 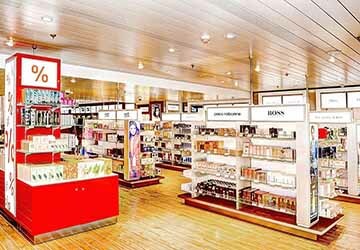 Select from an array of alcohol, perfume, cosmetics, tobacco, confectionery, clothing and lots more. 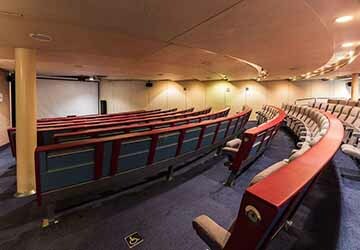 With a mix of showings for all ages, the cinema has three daily performances starting with cartoons for the kids and later showings for film craving adults. Older viewers can even enjoy a glass of wine whilst they watch. 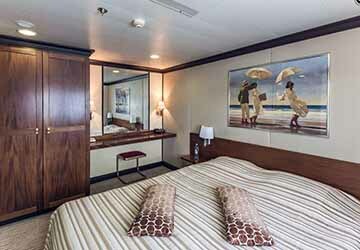 The Aquazone and spa are a luxury addition to this first class vessel. There’s a large swimming pool and a children’s pool, Jacuzzi, sauna and a gym. Bathrobes, towels and slippers are provided with swimsuits and trunks also available at reception. If you fancy a flutter whilst on board then you are in luck. 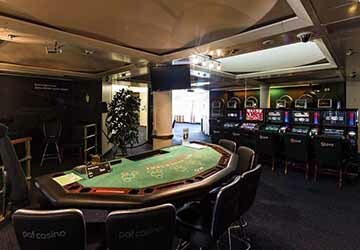 St Peter Line provide a casino with poker, roulette, slots, and blackjack. A variety of gambling machines are available with games to suit both novice and experienced players. If you are travelling for work purposes the Conference Hall is the ideal setting to conduct business. The air conditioned rooms are stocked with all necessary technical equipment with catering options also available if required. 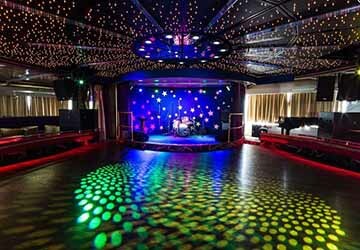 There are three rooms, one with a capacity of 30, the second fits 147 whilst the Columbus Hall is ready to take 423 people. 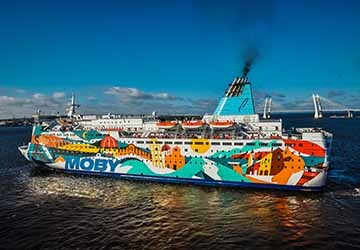 The journey will fly by for the young voyagers and parents alike aboard this fully equipped ferry. 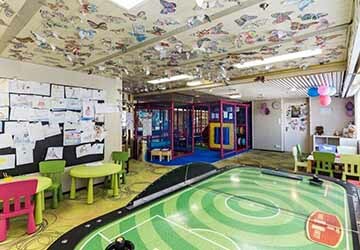 The kids playroom is the ideal way of keeping the little ones occupied on their trip. The games room comes with a huge range of activities and under the guidance of a qualified nanny. There are slides, mazes and a ball pool for the youngsters to get stuck in to. For the creative kids, a range of art materials are available. The ship is fully adapted for those travelling with restricted mobility. Class HA cabins are also available for disabled passengers. Please Note: Whilst we have taken great care in making our Princess Anastasia guide as accurate as possible, onboard facilities, services and entertainment may vary depending on the date and time of year that you travel, facilities mentioned may change without notification and ferry companies reserve the right to operate vessels other than those mentioned at time of booking without prior notification.